The 2015 international FGDA conference, "Improving Financial Inclusion of Smallholder Farmers”, brought together industry experts from MFIs and agricultural finance providers to exchange ideas and share best practices to close the financing gap for smallholder farmers. 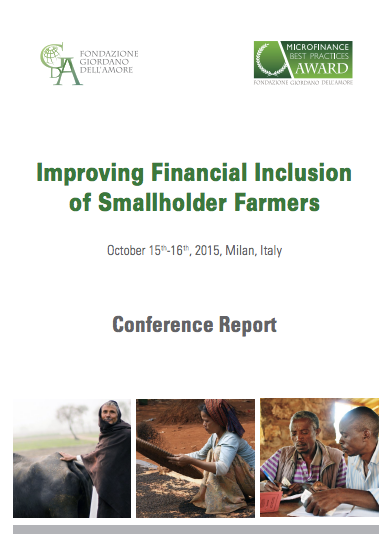 October 2015 Milan, Italy - stakeholders from across the smallholder finance industry met to foster conversations around smallholder financing including topics such as indexed insurance, making savings work for smallhoders, and digtal soultions. The conference highlighted the importance of integrating smallholders in tight value chains through client-centric approaches and long-term coordinated partnerships across networks. "It is important to understand that it is impossible to work on issues related to the fight against poverty through finance without including the aspects of information and technical assistance. And to propose such an offering, it is necessary to develop a larger community and better and stronger partnerships." For more information read the full conference report here. The Fondazione Giordano dell'Amore ( FGDA ) is a private foundation established in July of 1977 but already operational for a decade: it is the evolution of the Center for Financial Assistance to African Countries (Finafrica) created in Milan in 1967 by Professor Giordano dell'Amore , the then President of the Cassa di Risparmio delle Provincie Lombarde and rector of Bocconi University. Since 2006, the Foundation has focused its activities on the field of microfinance and inclusive finance.